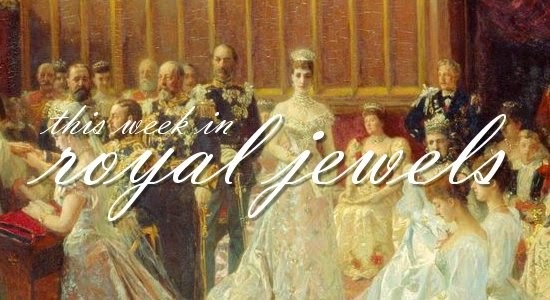 It's been a seriously jewel-heavy week -- enjoy the sparkle, and register your vote for the best pieces in the poll below! 10. At the Rijksmuseum in Amsterdam on Tuesday, Queen Maxima of the Netherlands wore the pair of jeweled tassel earrings that she's worn several times recently; she also wore them during the inauguration ceremonies in 2013. 9. Princess Madeleine of Sweden wore diamond and pearl drop earrings on Sunday for the christening of her son, Prince Nicolas. 8. At the christening, Crown Princess Victoria wore the diamond drop earrings from Queen Josefina's stomacher. 7. Queen Silvia wore pearls at her grandson's christening -- the same week we learned that she's due to welcome not one but two more grandchildren in 2016! More from the christening in our post from the event over here. 6. Queen Sonja of Norway visited London on October 8, wearing a silver statement necklace with a coordinating bracelet and earrings. 5. The Duchess of Cornwall presented the Man Booker Prize for Fiction on Tuesday; she wore her diamond-encrusted Van Cleef and Arpels Alhambra earrings for the event. 4. Queen Elizabeth II wore her pearl trefoil brooch when she opened a veterinary school in Guildford on Thursday. 3. Queen Letizia of Spain celebrated her country's national day on Monday, wearing her Bulgari aquamarine and diamond earrings at the annual military parade. 2. During the Belgian state visit to Poland, Queen Mathilde wore diamond and pearl earrings with a diamond brooch in Warsaw. She also wore Queen Fabiola's Tunisian earrings during the visit. 1. Queen Mathilde thrilled royal jewel watchers by wearing Queen Fabiola's Wolfers Tiara at the state banquet on Tuesday, pairing it with Fabiola's pearl and diamond earrings and her own laurel wreath necklace. More over here!